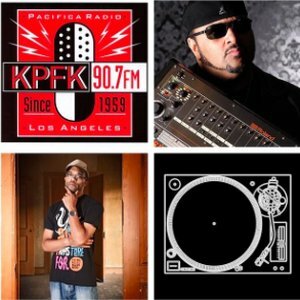 The Funky President J.Rocc has his very own radio show called “Adventures In Stereo”, every Sundays from 10pm-12am PST on KPFK 90.7FM in Los Angeles. This past Sunday (6.7.15), he had the legendary Egyptian Lover as his studio guest; J (along w/ Rhettmatic) were able to talk with him on early days of DJing, Uncle Jamm’s Army, & his new album “1984”….plus the West Coast Legend was able to get down live on the mix as well gettin busy on the Roland TR-808. Peep out the goodness!